Product prices and availability are accurate as of 2019-04-10 03:30:47 UTC and are subject to change. Any price and availability information displayed on http://www.amazon.co.uk/ at the time of purchase will apply to the purchase of this product. The MultiColoured controller is a really sick modded controller, it starts out as a Official XBOX One controller and then it is fitted with a 10 mode rapid fire elite mod, some multi coloured ABXY buttoms, thumbsticks and d-pad to finish it off. 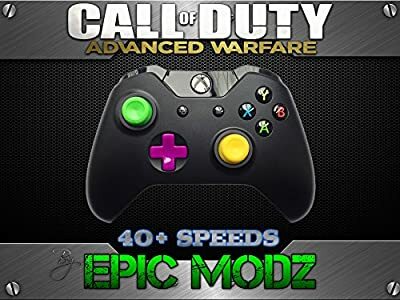 It is fitted with a 10 mode Elite mod chip that includes mods such as a fully adjustable rapid fire, drop and jum shot, akimbo drop shot, quick shope, and auto aim, all controlled by a single button. This controller will work with all the Call of Dutys including the new Black Ops 2 game Ghosts and Advanced Warfare. Supplied complete with laminated user guide, original Microsoft XBOX One retail packaging, 2 x Duracell batteries and 12 Month Warranty as standard. ALL THE FEATURES INCLUDING; DROPSHOT, AUTOAIM, AKIMBO, BURST + MORE !! ENHANCED CONTROLLER, FIRES FASTER THAN ANY OTHER WITH ADJUSTABLE SPEEDS !! CUSTOM MULTICOLOUR FITTINGS !! PRINTED INSTRUCTIONS INCLUDED !! BRAND NEW IN OFFICIAL MICROSOFT PACKAGING ! !